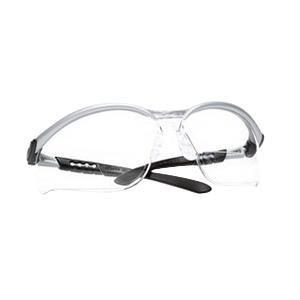 3M BX™ Universal size reader protective eyewear features built-in magnifying diopter on the lower lenses to give eye safety to workers who have difficulty reading small print or seeing small detail work. Sleek, contoured design of this eyewear provides both attractive appearance and functional eye protection. It comes with magnifying +1.5 diopter for enhancement reading. It has soft nose bridge, adjustable length temples and lens angle allow for customized fit. A clear polycarbonate lenses with anti-fog coating, absorb 99.9% UVA and UVB up to 380 nm. This eyewear with silver/black frame, is suitable for aviation, construction, food and beverage, general manufacturing, mining, oil and gas, primary metals and transportation. Protective eyewear meets ANSI Z87.1 safety standards.